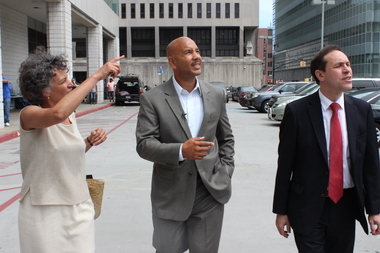 Dr. Mary Bassett, Ruben Diaz Jr. and Dr. Howard Zucker (L-R) toured Concourse Plaza on Thursday. CONCOURSE — Bronx Borough President Ruben Diaz Jr. called on the state to help fight the Legionnaires' disease outbreak that has claimed eight lives and sickened nearly 100 people in the borough. "I believe that all hands should be on deck now," Diaz said during a Thursday tour of Concourse Plaza, one of the sites that tested positive for the bacteria that causes the disease. "I came here today with the commissioner from the State of New York to let him know that this is the area here," he continued. "How is it that he can help?" New York State Health Commissioner Dr. Howard Zucker stressed that the state had been taking the Legionnaires' disease outbreak very seriously since its inception and had been conducting tests on the illness at the Wadsworth Center, the state's public health laboratory. "We’ve been doing all the testing on Legionnaires' disease in the city and in other parts of the state as well," he said, "and we’ve been in total coordination with the city officials and other local officials across the state." So far, 97 have been infected and eight have died since the start of the outbreak on July 10, according to the city. Officials believe the disease can be traced back to infected cooling towers that were found at five sites: Concourse Plaza, Lincoln Hospital, the Opera House Hotel, the Streamline Plastic Company and a Verizon office building. They have not determined which of the towers are responsible but all of the sites since been decontaminated, the city said. Diaz reiterated his call for legislation that would lead to inspections of cooling towers to prevent future outbreaks and said he was pleased that Mayor Bill de Blasio had come out in support of the idea. In the meantime, he emphasized that the borough needed all of the help it could get from any willing source. "I just want to make sure that the people of The Bronx rest assured that we are doing everything that we can," Diaz said, "that we have the attention of the city, that now we have the attention of the state."